We love to have these on a hot summer day. Minimal cooking so you keep the kitchen cool. 1. In a small bowl, toss quartered grape tomatoes with a dash of salt and pepper. 2. In another small bowl, combine softened cream cheese with mayo and dijon mustard. Mix well. 3. In a large bowl, combine bacon, lettuce, and tomato with the sauce. 4. Divide the mixture evenly among the 4 large burrito sized tortillas. Place the mixture on the bottom 1/3 of the tortilla. 5. 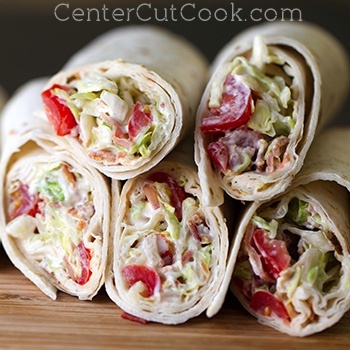 Roll the wrap up tightly and cut in half on a diagonal.